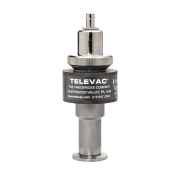 The Televac 7B Penning magnetron cold cathode vacuum gauge has a measurement range from 1 × 10-7 Torr up to 1 × 10-3 Torr. It indirectly measures absolute pressure by ionizing gas in the presence of a magnetic field. Unlike hot filament sensors, the 7B is resistant to inrushes of gas. The design of this sensor allows for easy disassembly, enabling quick cleaning and extended use. The 7B can be operated by the Televac MX200 rack-mountable controller or as an active gauge via the MX7B. These controllers automatically operate the cold cathode to provide a full-range vacuum measurement solution when the 7B is used in conjunction with rough vacuum sensors. 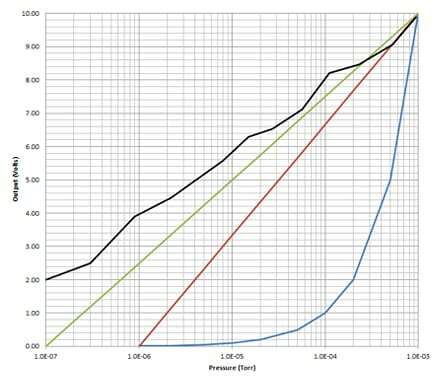 MX7B Active Gauge– the MX7B can be combined with an MX2A or MX4A active vacuum gauges to provide full range measurement from atmosphere (760 Torr) to 10-8 Torr. A digital vacuum gauge, the MX7B Active Gauge utilizes the well-known Televac 7B Penning cold cathode gauge to provide robust, contamination resistant, repeatable, and accurate vacuum measurement from 10-3 to 10-8 Torr. The sensor is also easily replaced and cleaned, saving you time and money. Other features include a multi-color OLED display, a configurable 0 to 10 V output indicating pressure, digital RS-485 and USB communications, and a set point relay and open collector for process control. 7E Double Inverted Magnetron Cold Cathode Sensor – This sensor has a measurement range from 1 × 10-8Torr up to 1 × 10-2 Torr. It indirectly measures absolute pressure by ionizing gas in the presence of a magnetic field. Unlike hot filament sensors, the 7E is resistant to inrushes of gas. The design of this sensor allows for easy disassembly, enabling quick cleaning and extended use. The 7E can be operated by several Televac controllers, including the MM200, MC300, and MP7ER. The MM200 and MC300 controllers automatically operate the cold cathode to provide a full-range vacuum measurement solution when the 7E is used in conjunction with rough vacuum sensors.